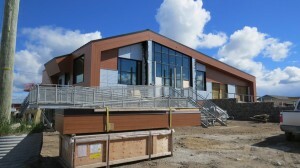 Parkin has enjoyed designing another great new facility in the far north. This 5,000 sq.ft. RCMP building in Arviat will be complete at the end of October, 2017. The building is a steel structure built on steel piles with an arctic foundation system. The building envelope is designed to exceed the requirements of the Good Building Practices Guidelines for Nunavut. Materials and construction details were selected to ensure ease of transportation, and ease of installation.